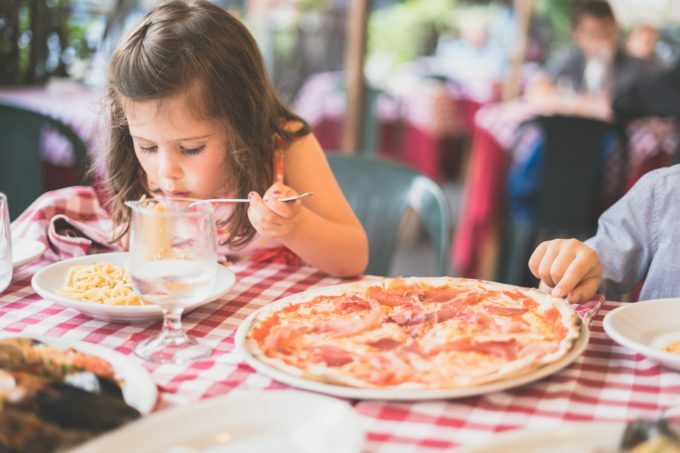 According to research, children who eat frequent meals with their family have better nutrition, higher grades, increased self-esteem and exhibit less risky behaviors. Yet, despite these important benefits, only 30 percent of families make time to eat one meal together each day. One barrier to dining together, especially for families with young children, can be picky palates. It’s easy to become a short-order cook when you have a picky eater in the house. Many parents get stuck in the habit of making separate, on-demand meals for their kids instead of preparing one meal everyone can sit down at the table and enjoy together. If this has become the routine at your house, try these tips to please your picky eaters while saving time and sanity. Cook with your kids. Children are more likely to buy-in to a meal if they are involved in making it themselves. Let your kids be sous-chefs by assigning them age-appropriate tasks, like tearing lettuce or mixing a marinade. Have them read through recipes with you, prep vegetables, mix ingredients together or top dishes with fresh herbs or cheese. Your child will not only be more apt to eating what they helped prepare, they will also develop basic cooking skills and learn about healthy foods. Pizza is a fun, easy to assemble meal even your youngest child can get involved in. Try this Monterey Jack Pita Pizza. It’s simple and made with ingredients from all five MyPlate recommended food groups: whole grains, lean meat, fruit, vegetable and dairy. Fix their favorites. Try incorporating some of your kids’ favorite foods into your meal rotation for your best shot at a fuss-free family time at the table. If your kids love pancakes, make them for dinner. For a well-rounded meal, serve them with fruit, a glass of milk and eggs or turkey bacon. If your child would rather snack on chips make Mambo Nacho Bowls for dinner. Your kids will love adding their own toppings like Mango-Cheese Pico De Gallo. Pair to please. Getting kids to eat their vegetables is a common struggle but pairing them with a delicious dip may help. In fact, a study published in the Journal of the Academy of Nutrition and Dietetics found that the addition of a plain or herb-flavored dip increased preschoolers’ intake of vegetables. Try serving your kids veggies with hummus, guacamole, melted cheese dip or a ranch dressing made with protein-packed Greek yogurt. This October join The Dairy Alliance in our Eat Together, Eat Better with Real Dairy campaign. Learn more about the benefits of eating together, how to plan and prep for nutritious family meals, and find quick and easy recipes by following us on Facebook, Twitter and Instagram. Registered dietitian with The Dairy Alliance educating health professionals and the general public about the importance of dairy in the diet.